NFL Network’s Ian Rapoport reports that Washington Redskins star cornerback Josh Norman suffered a broken rib and damage to the lining of his lung in his team’s Week 4 loss to the Kansas City Chiefs. He is expected to miss two to four weeks, but the team has not officially ruled him out for their next game against the San Francisco 49ers. 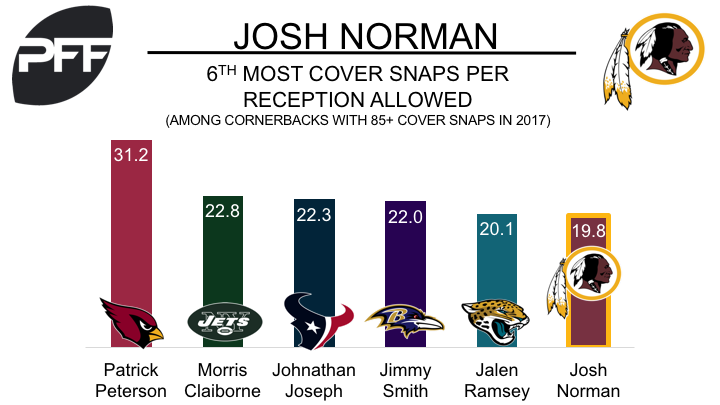 In 2016, his first year with the team, Norman played 1057 of 1101 possible defensive snaps, and ended the season ranked 24th out of 101 qualifying cornerbacks with a PFF overall grade of 81.0. He continued to perform well coverage, and averaged 13.5 cover snaps per reception, the eighth-best mark among cornerbacks with at least 175 coverage snaps. Through four games of the 2017 season, Norman has continued to shine in coverage and has surrendered just six receptions for 89 yards from 15 targets so far. His average of 19.8 cover snaps per reception currently ranks sixth among 79 cornerbacks with at least 85 coverage snaps. If Norman misses the team’s next game, Quinton Dunbar will slot into the starting lineup opposite Bashaud Breeland. The third-year cornerback performed well in relief of Norman in Week 4, where he was targeted five times, allowed three catches for 14 yards and ended the game with a coverage grade of 81.9, the highest coverage grade of the game.